YOUNG, Andrew Jackson, Jr., a Representative from Georgia; born in New Orleans, Orleans Parish, La., March 12, 1932; educated in public schools of New Orleans, Gilbert Academy, and Dillard University; B.S., Howard University, 1951; B.D., Hartford Theological Seminary, 1955; ordained by the United Church of Christ; served as pastor in Marion, Ala., and in Thomasville and Beachton, Ga.; associate director, Department of Youth Work, National Council of Churches, 1957-1961; executive director, Southern Christian Leadership Conference, 1964; executive vice president, Southern Christian Leadership Conference, 1967; chairman, Atlanta Community Relations Commission, 1970-1972; elected as a Democrat to the Ninety-third and to the two succeeding Congresses and served from January 3, 1973, until his resignation January 29, 1977, to become United States representative to the United Nations with the rank of Ambassador and served in that capacity until his resignation September 23, 1979; elected mayor of Atlanta, Ga., October 27, 1981; reelected in 1985 and served from January 4, 1982, to January 2, 1990; unsuccessful candidate in 1990 for nomination for governor of Georgia; is a resident of Atlanta, Ga.
DeRoche, Andrew. 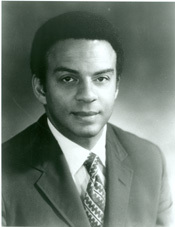 Andrew Young: Civil Rights Ambassador. Wilmington, DE: Scholarly Resources, 2003; Young, Andrew. An Easy Burden: The Civil Rights Movement and the Transformation of America. New York: HarperCollins Publishing, Inc., 1996.